It's been a busy few weeks at the King Power Stadium and whilst your correspondent was away for the festive period Leicester City certainly entertained those who stayed at home. Here are some brief Conclusions from Christmas. It got better as it went. The loss to Cardiff City was seemingly due to a maddening inconsistency in front of goal exemplified by Leicester's narrow victory away at Burnley. A Boxing Day bore draw in Hull followed - earning the Foxes a valuable point against their play-off chasing rivals - but will be forgotten quickly after a hatful of goals against Huddersfield Town (see below). The icing on the Christmas cake was the professionalism of City's display against Burton Albion in the League Cup, a 2-0 victory proving more than enough to undo the League Two side. City won big. The most memorable headline from this winter will be the 6-1 thumping of Huddersfield, making Nigel Pearson's side the first since Dave Halliday's top flight side of 1957 to score six twice in one season. 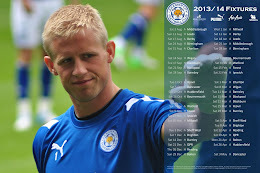 It is a landmark that speaks volumes for the attacking progress made by the Foxes since the start of the season. Steve Walsh has unearthed another gem. Although less hidden than other talents discovered by Leicester's chief scout, in signing Chris Wood it seems Leicester have got themselves a real talent. Only four other City debutants have scored twice on their first appearance in history. With fourteen goals already this season - and three bagged for City in his two appearances - Chris Wood has the goalscoring capability to lead Leicester's front line and forge a deadly partnership with the seemingly unerring David Nugent. Where that leaves Jamie Vardy, the Great £1 million Hope, Martyn Waghorn, the returning hero or Marko Futacs, the young pretender, remains to be seen.